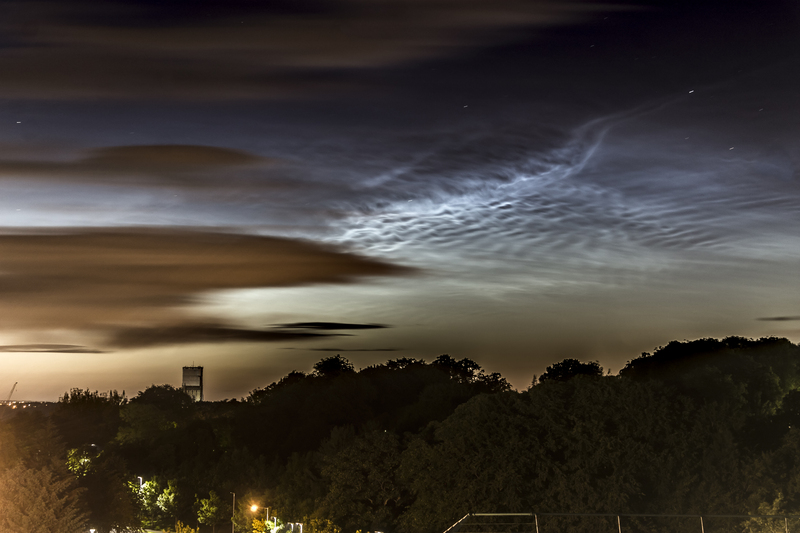 On June 16 I was lucky enough to capture my first ever display of Noctilucent clouds, and naturally took plenty of pictures. I was lucky to be in a location in Durham with a good view to the North, and conveniently, the cathedral was to the North too! This photo was taken late in the display, as most of the NLCs were beginning to fade away. This patch of NLC was one of the last ones visible, and lower, much less interesting clouds were beginning to creep in & block the view. However, for this short period of time, everything aligned together nicely to create an interesting shot. Taken with my Canon EOS 1100D, with the stock variable-zoom lens set at 49mm. 40s exposure at ISO 100 on a fixed tripod, processed (various enhancements) with Camera Raw & Photoshop. This is a timelapse of an NLC display I photographed in Northumberland on the 16th June this year, I was using a 50mm lens on a Sony A7s. The noctilucent cloud is in the upper right of the image, hovering over some beautiful pink and purple-tinged lower level clouds just after sunset during last year's autumnal equinox. A single 1/1250s exposure at f/5, 155mm, shot with a Nikon D50. No processing. One of the most beautiful sunsets I have ever seen! If anyone is interested there is a bright and extensive NLC display in progress NOW reaching up to Capella in altitude, best display for some time! My first sighting of NLC's season 2013... this display in bright full moonlight looking north towards Kelso racecourse around midnight.